The NCAA Division I Golf Championship Trophy at Rich Harvest Farms. 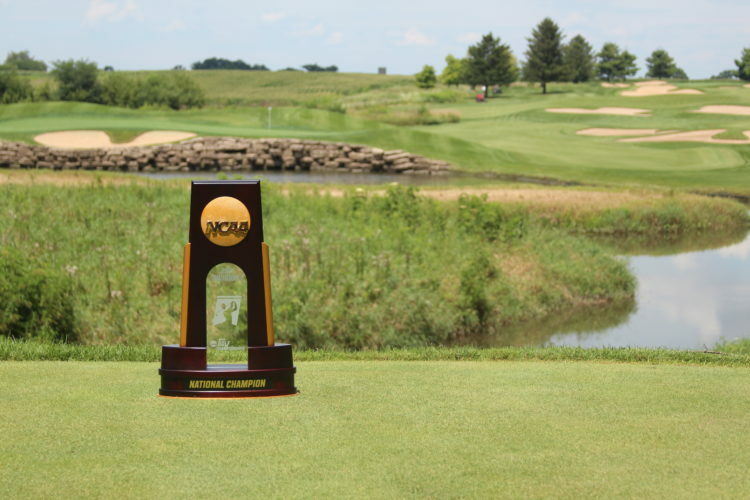 The field for the 2017 NCAA Division I Women’s Golf Championships, to be conducted May 19-24 at Rich Harvest Farms in Sugar Grove, Illinois, has been determined. Four regional competitions were held May 8-10 and the top six teams and three individuals not on a qualifying team advanced to the national championships from each regional site. The four regional sites included Albuquerque, New Mexico; Athens, Georgia; Columbus, Ohio; and Lubbock, Texas. Of the 384 regional participants, 132 advanced to the finals. Northern Illinois University will serve as the host of the championships and the Golf Channel will provide live coverage for the final three days of the championships May 22, 23 and 24. The teams and individuals advancing to the 2017 championships finals are listed below. For ticket information visit www.ncaa.com/tickets or https://2017ncaagolf.eventbrite.com or contact David Gennett at Rich Harvest Farms at 630-466-7610. The championship format consists of all 24 teams and 12 individuals completing 54 holes of stroke play, and then the top 15 teams along with the top nine individuals not on an advancing team will advance for one additional day of stroke play to determine the top eight teams for match play competition and the 72-hole stroke play individual champion. The top eight teams then compete in match play for the championship. Live results from the championship can be found online at www.ncaa.com.